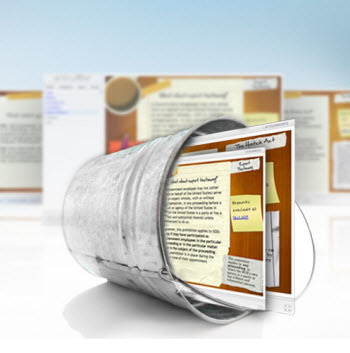 I get a lot of questions about how to move past the PowerPoint look when building rapid elearning courses. My first suggestion if you’re working with PowerPoint is to step away from the original content. Start with a blank screen and then based on the context of the course, build the look and feel that’s appropriate for the content. With that said, sometimes you can get away with a pre-built template. A good example is with office-themed templates. They work because they’re generic and can fit the look required for a lot of corporate elearning. The template isn’t a replacement for analyzing the appropriate design needs for your course, but if you do determine that this type of template is appropriate, it’s a good head start, especially for those who have no graphic design expertise or access to graphic design resources. 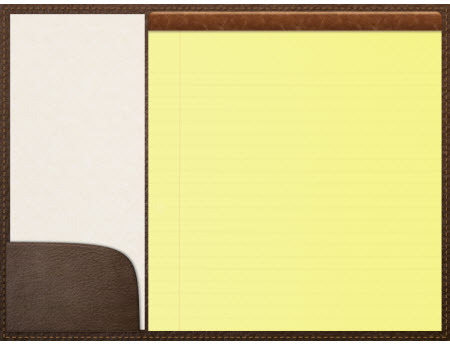 Here are some free office-themed templates and assets. The first is a new one and the rest are ones I’ve given away in previous posts. Here’s a free PowerPoint template that features 10 layout options and also comes with a Quizmaker file. Original blog post that explains how to create and use the closed and opened version of the personnel folder. Original blog post that explains how to get more out of the free clip art. Original blog post that explains how to make and use the tabbed notebooks. Original posts that highlight the portfolio template and shows off some rapid elearning tips and how to create the portfolio. Original blog post that shows how to create your own projection screen. Blog post that features the clipboard. 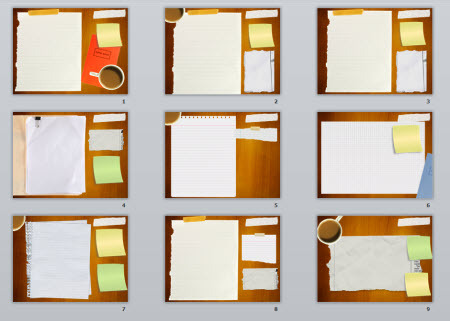 These free templates and assets are great for office-themed presentations. They also work great for simple exploration interactions where the learner can click on various resources to collect information. Combine that with some decision-making activities and you have all of the assets you need to create simple, yet interactive elearning modules. I have been following you for 3 years now and you continue to be generous with elearning tools, pratical tips, rapid development how-to’s and so much more. I sincerely appreciate the time and effort you put into collecting and presenting so much time saving and helpful information for those of us Instructional Designers, eLearning developers and trainers. I hope to see and meet you in October at the Renton Community Center. @Brooke: thanks for the kind words; hope you’ve been able to enjoy the summer. @Patty: glad you like the resources and hope they come in handy. Looking forward to the event in Seattle, as well. Enjoy, and spread your wealth of knowledge! 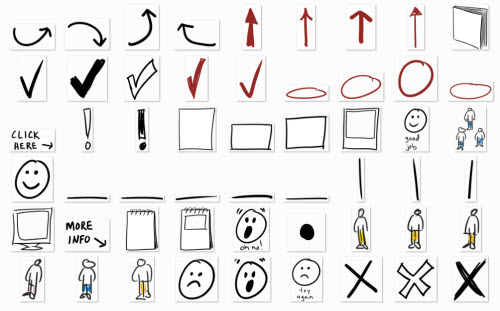 I can’t wait to try these assets and templates. You and your entire team are a dream come true. Thanks so much. Tom, thanks a lot for these templates and the never-ending ideas, inspiration and resources you provide! hmmm all the points covered are really usually. The image of the paperclip you use just really bugs me! Love your column and examples. @Darlene: 🙂 maybe you’re having Clippy flashbacks. Thanks for these catchy templates. Tabbed Notebooks and clipboard are the ones I am going to use. Would like to see more of these. I was wondering… how did you get the quiz to load while retaining the woodgrain background. Also, any thoughts on how to the that same background to an engage interaction? @Valerie: the quiz has a wood background using Slide View. Also, you can make the quiz template transparent and let the PPT slide background peak through (we didn’t do that in this demo, though). Here’s a tutorial to help you get started. 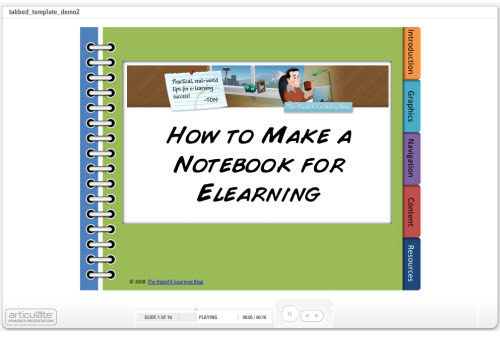 Thank you for sharing these templates.You peoples are the rocking stars of the e-learning world.!!!!! !